#13 - Why is "eptic" highlighted? I can see "ASK", but "eptic" ? ask skeptic? sk being re-used? THWOTH wrote: Don't you think we should be doing this by the single transferable vote (STV) model, like they do for the Eurovision Song Context? BTW: There's an app for that! #3 is the most aesthetically pleasing, but it doesn't have any connection to RS that I can see. the rat in the life preserver is so cute with his little inquiring magnifying glass, but it suggests rats deserting a sinking ship - a bit negative. All the "RS" ones just make me think of the word "ARSE". So #5 (the infinity Moebius strip) it is. I like 9. When I look at the entire array, that one is "different from the rest". I tried to pick a 2nd and 3rd but nothing really stuck out to me. Grimstad wrote: I like 9. When I look at the entire array, that one is "different from the rest". I tried to pick a 2nd and 3rd but nothing really stuck out to me. That's it in a nutshell, it sticks out from the rest, many of which I really liked when I first saw them. I like the idea of #5, but I think the logo still needs some elaboration. #6 and #8 are my favs. I like the filigran Style. 2) I don't like the quasi-mathematical thing. 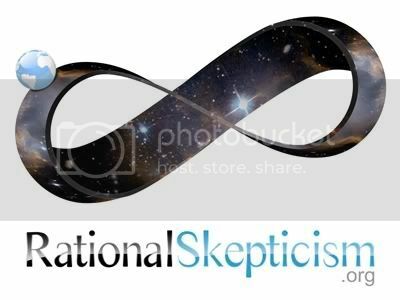 Rational to the power of scepticism just doesn't make any mathematical sense, which means it's nonsense, which is precisely what rational scepticism is supposed to avoid. 5) I think it looks a bit weird having the Earth rolling around a Möbius strip, and although I've read the explanation of what it's about, I don't think the connection's immediate obvious. 7) I don't like the highlighted letters 'a' and 'sk'. Though rational scepticism might be about asking, it isn't so on the strength of having the letters 'a' and 'sk' in it, any more than God is about good orderly direction because you can make an anagram out of it or some such. And outside of America, it's spelt 'scepticism', so it doesn't even have 'sk' in it. That leaves 4, 6, 10 and 11, and since I'm only allowed 3 votes, I'll strategically vote for the 3 that have the most votes at the moment. Rilx wrote: I like the idea of #5, but I think the logo still needs some elaboration. The one here is the probably the blandest of all the versions posted in the design-a-logo thread (I'm sure many will remember the paisley hippie version with peace signs). Even so, the bland seems to be doing pretty well. I voted 5; it implied to me a world afloat in a universe of endless possibilities (or a one-sided never-ending discussion?) and it just looks nice and calming. I changed my vote to number 6, I like the mechanical paint that represent my view of the uni(pluri)verse, and also because I think that number 5 is too difficult to use, for example for the favicon. CookieJon wrote: I voted 5; it implied to me a world afloat in a universe of endless possibilities (or a one-sided never-ending discussion?) and it just looks nice and calming. The site shall have the calmer version. My, this is difficult! I voted for 5, 6 and 9, but I wish I had more votes to give. 3 and 4 are excellent too. In fact, whichever of the fourteen wins, we'll have a logo to be proud of. Congrats to the authors, great job! I see variations on my previous avatar 5 and 11 choices are doing well ....quite pleasantly surprised with the support for 11 as I really liked that but others seemed indifferent at the time of discussion. 6 is cool too tho the shape is a bit awkward. BTW those interested might make their number 1 choice their avatar until the contest closes since there was no way of showing first choice. I'd also like to see some of the non-winners used in various forums. The cartoon mouse would be ideal for the debunking section and the universe mobius for the science forum etc. Indeed, and the one up for vote is very easy on the eye, I think a lot due to the figure 8, and of course the colours. I liked the eye too, but after looking at the variations in the design thread it started to look a bit "generic" or "clip-arty", whereas the circle/firgure-8 is truly a unique logo that looks good in a variety of styles. Macdoc wrote: I'd also like to see some of the non-winners used in various forums. The cartoon mouse would be ideal for the debunking section and the universe mobius for the science forum etc. The mouse was great... very cute and with the right attitude. I was wondering about the life preserver, though... I know the site is subtitled "lifeboat for the rational mind", but didn't the "lifeboat" idea first come from the sinking of RDF, with this site picking up the "survivors"? If so, I don't think that's a good note to incorporate into the logo, or is "lifeboat" intended more generally than that these days? In either case, I'm still left with the idea of rats deserting a sinking ship, which is a bit negative. Last edited by Emergence on Jul 09, 2010 3:46 pm, edited 1 time in total.